Only 23 percent of executives are strong at strategic thinking. Why? It’s difficult to become skilled at something if you don’t have a framework and the tools with which to practice. If a golfer only had a putter and 6-iron in her bag and lacked a swing framework, she’s going to be much less effective than the golfer with strong swing mechanics and the full range of golf clubs to use. 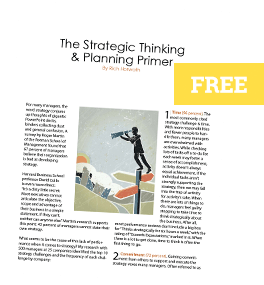 The following infographic provides you with a strategic thinking framework used by tens of thousands of leaders around the world to simplify the complex art of setting strategic direction.